We had a fantastic time yesterday. 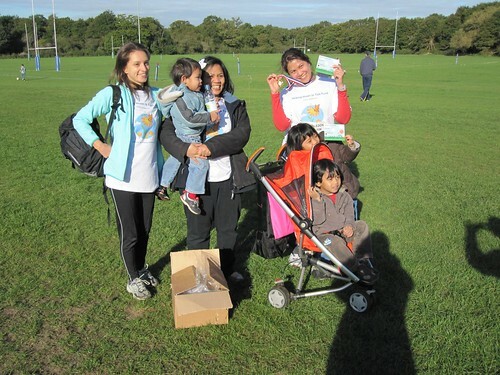 Eju, Imaan's aunt ran the Wimbledon Audi 10K race in support of the Help Imaan to Talk Fund. The weather was freezing cold but it could not dampen our spirits and we had a great time cheering her on. Eju achieved her personal best time and won a shiny medal too. Wow! We are extremely proud of her! I know my parents will be proud of my sister. WELL DONE EJU! She was able to raise around £150. A huge Thank You! to all the generous sponsors. Thanks to Roby and Linda for coming along and supporting us as well. Eju will be running (again!!) the 10k Mo Run in 13th of Nov, 2010 at Greenwich Park, London and is aiming to better her time. This time she won't be alone. Our friend Roby is going to join her as well and they have both started training for the run. They are also actively looking for sponsors. 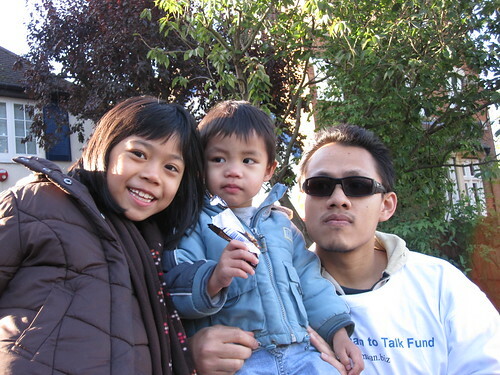 Thank you so much Eju and Roby, and if anyone would like to sponsor Eju or Roby, I know that we would be really grateful!.